Now that spring is finally here, I can’t wait to see those wild animals you’ll see in our backyard or front yard. Well, except for the chipmunks that I find pests as it constantly digs the whole yard to find nuts, and also climbs into anything just to dig into something no matter if it’s your plants in the pot. It also eats your plants recently sprout fruits. It will aggravate you to see them enjoying the sprout fruits while you were dying to plant them so they could give you free fresh organic produce. Anyways, one thing that I can’t wait to see is those wild bunnies in the yard. We had seen them last year in our yard munching the grass and fresh cut grass we have. Doesn’t bother me at all, as long as they won’t eat my produce I am fine with them. Well, never seen those in the act, though however, aren’t they just so adorable and fluffy? I’d taken this one last year, when my family and I got home since I don’t know where, I forget about it. We were just observing them and there were actually a pair, must be a male and female I believe, couldn’t determine if they really are hence, we assume it is. 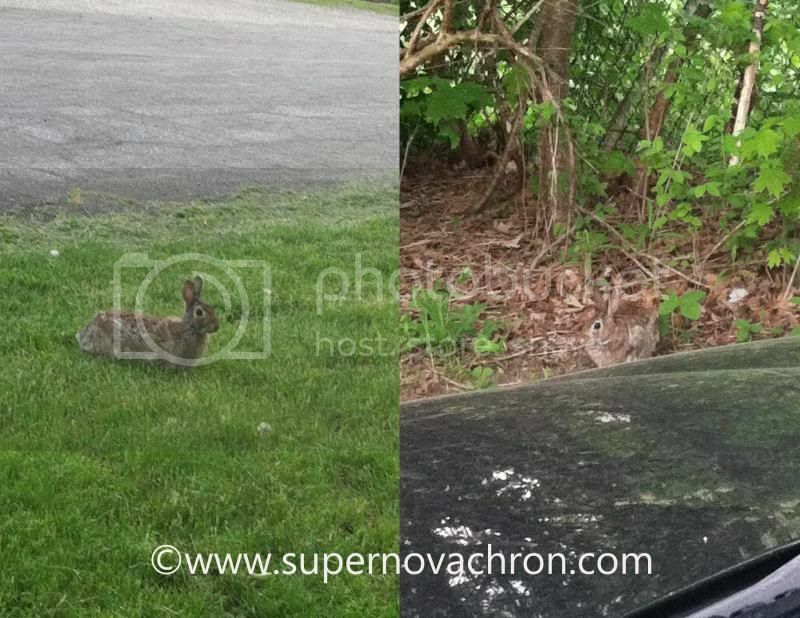 One was in the front yard and the other was near beside the bushes, we watched them hopped away as we started to get out of our car. I don't mind chipmunks, they don't bother my plant. We have many wild bunnies here too. We have a family of them too here in this yard and in our yard back in Kansas. They are good, but not so good when it comes to the garden. LOL! They would help themselves to the garden and eat my veggies, but we love them so we don't mind. They are adorable and my kids think so too!